Officially organized by AVIC CanNews and Oppland Corporation, the 2nd CCHS 2015 took place in Beijing on June 30th and July 1st 2015. Engineering of heliports and helipads (AE Engineering). Respectively, the 5 Italian enterprises that joined CCHS 2015 were Neos Aerospace Technology, Sator Aerospace, Delta Interior Design, Xesa Systems and Airport Engine Engineering. Wang Jianhong, Deputy General Manager Zenisun Heliport Group. 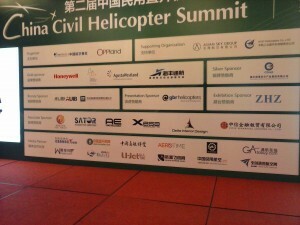 Among the sponsors, Honeywell, AgustaWestland, GBR Helicopters and CITIC Financial Leasing. Through its participation to CCHS 2015, Italian Aerospace Network attracted great interest from the main players of the Chinese growing helicopter industry, that according to the Central Government is going to need over 11.000 new helicopters and 2.400 general aviation airports/heliports in the next 10 years. Over 200 selected guests attended CCHS 2015 in Beijing and discussed with IAN Members about current and future projects. As strategic market advantage IAN keeps working on a daily basis therefore it successfully grows and nurtures relationships before, during and after specific events, conferences, forums, etc. It is important for IAN to provide efficiency for the Italian and Chinese parties involved in the bi-lateral relationships in terms of technical, sales and after-sales support. The Italian Aerospace Network (IAN) is a Consortium of Italian SMEs operating in the aviation & aerospace industry with offices in Italy, Shanghai and Xi’an whose main scope is to support Italian and Chinese enterprises to know each other and develop joint cooperation programs.